v 1.0 - New release. In order to uninstall plug-in run uninstall.exe or use Add and Remove Programs item in the Control Panel. Click and drag to mark translucent areas. Marked areas are marked semi-transparent blue color. After applying, some opacity will be assigned. Unmarked area will be transparent. Click to fill translucent area. Using this tool for manual erasing/restoring undesirable areas. You can set brush size and softness. Revert all operations to original image. Use this slider to increase/decrease strength of background erasing. Use this slider to increase/decrease saturation of selected object. Use this slider to increase/decrease transparency of selected object. Check this flag if you want to fill holes within received mask. Check this flag if you want to remove debris within received mask. Determines size of the brush in pixels. 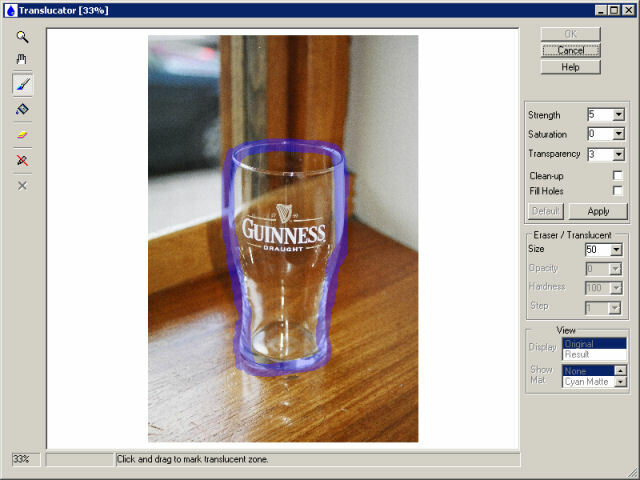 Use Display menu options to switch between previews of the original and extracted images. Use Show Mat menu options to preview the extracted object against a colored matte background. To display a transparent background, choose None. This plug-in works under RGB layer with 8 or 16 bits/channel only. If your image has no layer you must create one at first. Create a layer (if your image is not layer yet). (For example, in the Adobe Photoshop use "Layer->New->Layer from Background..." menu item). Run the Translucator plug-in. (For example, in the Adobe Photoshop use "Filter->Image Skill->Translucator" menu item). Using Mark translucent zone brush and (or) Flood fill translucent zone tool mark translucent area that you want to delete. 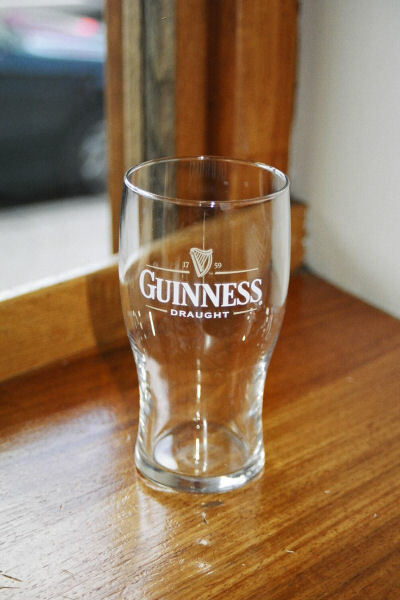 Press Apply button in order to extract selected objects. If you result of extraction is unsatisfactory, adjust the Strength control or (and) Opacity control, then press Apply again. If need, delete all marks using Delete all marks tool and repeat steps 4-6 in order to achieve desirable result. If you can not do it, use Manual Erase/Recover tool . If need check the Fill Holes and (or) Clean-up flags for hole filling and debris removing, then press Apply. 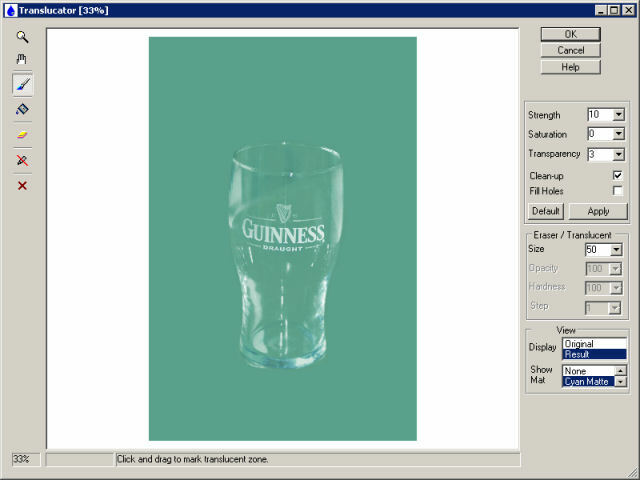 Use this tutorial to learn how to extract the translucent object ("Guinness glass") from the image. Our image is a background and we must create layer. For example: in the Adobe Photoshop "Layer->New->Layer from Background". Run Translucator plug-in: "Filter->Image Skill->Translucator ". 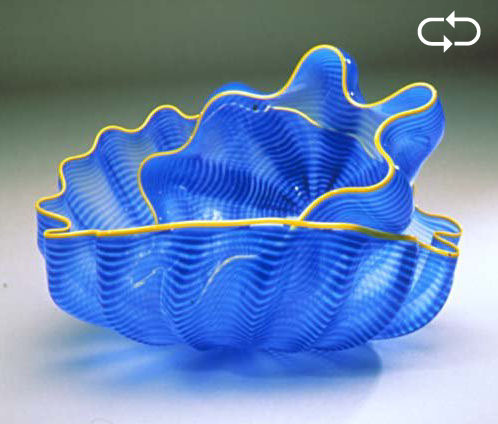 Select Mark Translucent zone brush and mark object (semi-transparent blue). You do not need outline object accuratelly. Translucent zone can include part of background. 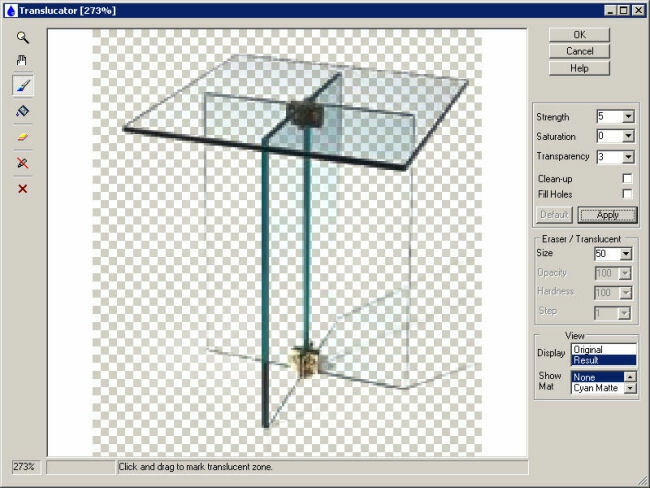 Select Flood fill tool and fill translucent area. You can see that result is needed for tuning. Set background color to Cyan by setting Show Mat parameter to "Cyan Matte". Increase Strength parameter to 10 in order to increase degree of erasing. Check Clean Up flag in order to avoid debris. This is a final result of extraction. Press Ok and pass result image to host program. I can not run Translucator or Translucator is grey out in graphic host’s effect menu. 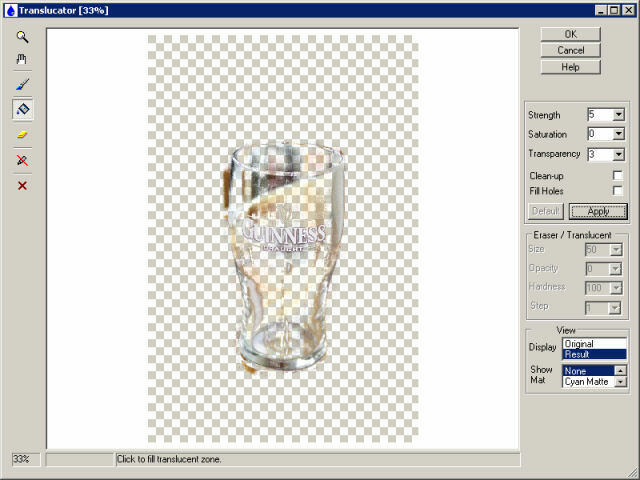 Graphic hosts disable the plug-in if the current image is not suitable for use with Translucator. 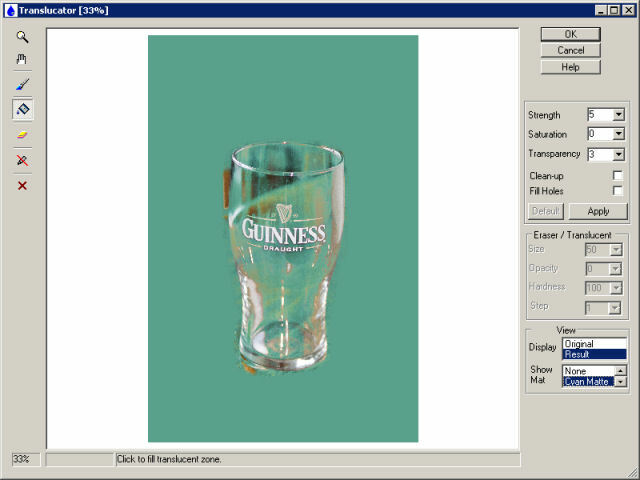 Image must be in RGB format with 8 or 16 bit/channel and must have a layer (i.e. image must have 4 channels: R, G, B, and Alpha). If image has CMYK, LAB, Grayscale or something other format, you have to convert it to RGB. If image has no layer you have to create it at first. Why my marked zone disappears? All marks are removed when you select “Manual Erasing” tool . Use this tool at final stage of extraction. What does happen if my image already has transparent area? When you process image with transparent areas, the final transparency in such points will not less than source transparency. I.e. plug-in does not increase alpha value in transparent areas. How does plug-in process selection? The Translucator affects to selected area only. The unselected area is still unchanged. The unselected area is shown a red semi-transparent color in main plug-in window. Plug-in deals with the bounding box selection. Try to decrease “Strength” parameter and press “Apply” button again. Check flag “Fill Holes” in order to fill small holes into extracted object. You can order full version of this plug-in now ($29.95). Just now, we upgrade our products for registered customer free of charge. Copyright © 2006-2009 ImageSkill. All rights reserved. Partners.